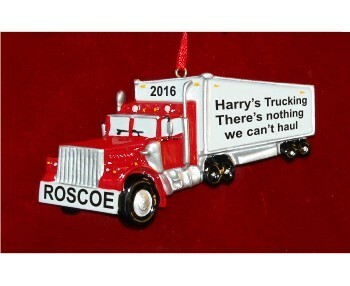 The big rig drivers on your list will get a kick from this trucking ornament personalized just for them! The drive that semi personalized Christmas ornament features a very lifelike tractor pulling a personalized trailer. Share your custom details, and they will be hand lettered where shown but in a handsome font to create a personalized trucker ornament that is one of a kind. An attached cord allows you to display this truck ornament wherever it makes you happy, from the Christmas tree to the rearview mirror. Wish your favorite long-haul or local truck driver a wonderful holiday season with the personalized semi truck Christmas ornament that arrives with our plush velvet gift pouch.